The greatest pleasure from this blog is to receive both questions and answers from people from all over the world. Questions are naturally more frequent, and so is my embarrassment when I find it very difficult to answer them. Less frequent are when a descendant of a family I have mentioned in my blog appears with some never-before-seen material. It has happened a couple of times before (to mention the Fadgyas grant of arms, for instance, or the Urbanovics seal). I was particularly pleased to receive an email from a descendant of the Karatsony of Hodos family, now living in Romania (although the spelling of the name has been as usual very flexible over the centuries, I shall use the most common academic appellation throughout this article). 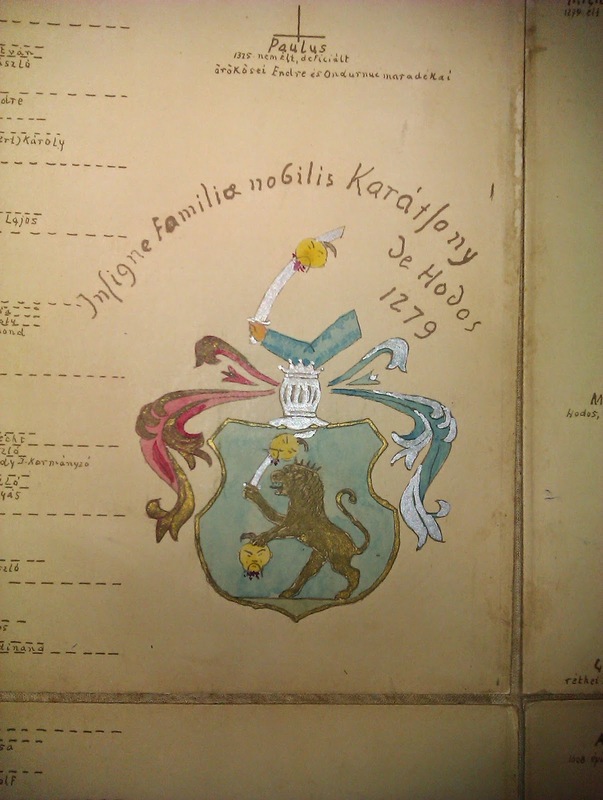 At first it was an image of the Karatsony coat of arms, without any text: clearly a cheeky reference to my earlier post on the family (see here), in which I insisted that an ‘official’ coat of arms for the Karatsony of Hodos does not exist. Clearly I was wrong. The Karatsony coat of arms, as one can see, embodies the typical Hungarian noble attributes to its very extreme. Its lion (crowned, as a special mark of nobility), grasping a sabre, and its crest of an arm holding the same is quite enough to represent the heroic credentials of a Magyar warrior. The inclusion of not one, not two, but three severed Asiatic heads, however, appears gratuitous in the extreme. Very rarely does Hungarian heraldry indulge in quite such sadistic aesthetics, but it is certainly memorable. It must be added that members of the Karatsony family did use coats of arms with slightly different charges – hussars etc. It is the same family – it just shows the flexibility and imagination with which Hungarian noblemen approached their personal and family insignia. The family legend is that the lion in the shield is a Cuman lion, while the three severed heads represent the three men whom the Karatsony ancestor killed to defend the King of Hungary. 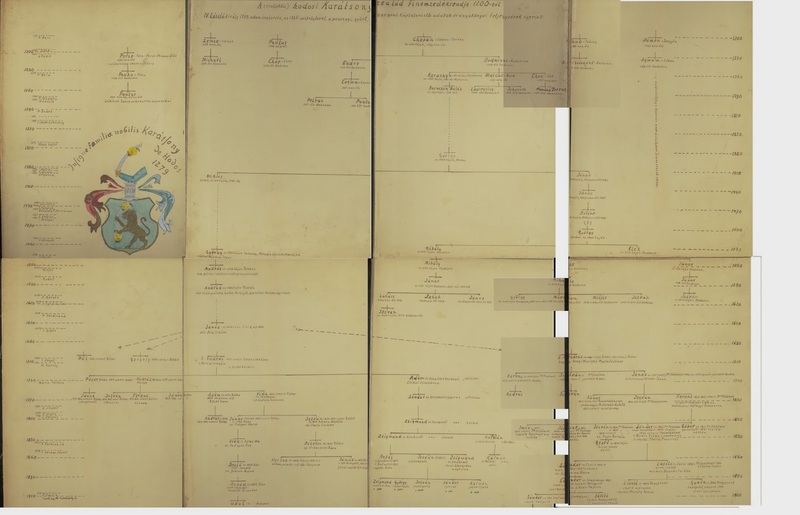 Even more interesting however is the complete family tree of the Karatsony: from its very beginnings until the 20th century. Although genealogical literature considers Blaise Karatsony (Karachon Balas in the tree) as the founder of the dynasty, and was mentioned in 1279 in a manuscript by Ladislas IV of Hungary, the family historian has added several other early medieval individuals, including Blaise’s father and grandfather, as well as great-grandfather. I am not sure whether this is conjecture or is based on medieval documents. Whatever the case, a very interesting element is the attempt to equate unusual names with modern Latin of Hungarian ones. So Chepan, apparently the earliest known ancestor (roughly from 1200 to 1279), is translated as Istvan. Even more interestingly, the name of Karachun, which was a first name and only later did it give the family its surname, is equated with Gratian. The latter name did have some currency in that period, since Gratian’s Codex from the 12th century is the central collection of canon law used in the medieval period. It would, however, be surprising that the clerks writing the manuscripts, who were without exception educated in church establishments, and who had pretty adequate skills in writing medieval Latin, would scramble such a famed name into a form such as Karachun. The family tree shows two main branches which survived into modern times; they were set up by Miklos and Janos, the sons of Gyorgy, mentioned in 1380. The line of Janos stayed in Hodos, their original feudal seat. It is probable therefore that Janos was the senior line. However, this original Hodos line died out around 1650, as the tree shows. The other line, that of Miklos, married into a Rethe noble family: his probable son, Gyorgy, married Ilona Markus of Rethe in the 16th century. This marriage was the beginning of the Karatsony in Rethe, and in fact the origin of all subsequent members of the family. From this important point the tree follows the fortunes of Karatsony family lines: some which stayed in Rethe; one line moved to Kecskemet in the 18th century, with Adam Karatsony, who was a reformed rector. His descendants, variously moved to Budapest, or even Kesmark (Kezmarok), and have been followed to the 20th century. Another line, that of Istvan (born 1833, married to Urbanovics Rozsa), moved to Budapest and Levoca/Leutscha (Janos). The second major line to have separated from the main Rethe family is that of Andras, who in the 17th century married Mariska Hegyi of Hegy, and moved with her to Puszta Fodemes (today Puste Ulany, a village in the Senec district). This branch became prolific and later moved into various counties. Their marriages became far more prestigious than the local county nobility from which they had sprung, and their spouses included the following families: the Podhradszky de Podhragy, a medieval family from Trencsen county; the Sandor de Slavnicza, a family of magnates who later achieved the very rare title of Prince; the Thurzo de Nositz, who included eminent scholars; the Burian de Rajecz, who provided a foreign minister for Austia-Hungary during World War I; and the Mocsary de Bocsar, an illustrious family who descends from the 13th century Count Bocsar – members were magnate landowners, took part in the Wesselenyi Magnate Conspiracy, the Rakoczi War of Independence, and Lajos Mocsary was one of the most important Hungarian politicians of the entire 19th century. The line of Sandor (born 1810 in Puszta Fodemes), survived to the present day and lives in Romania. Notable of this line is another Sandor (born 1865), who rose to become the Royal Chief Forestry Advisor of the Kingdom of Hungary. 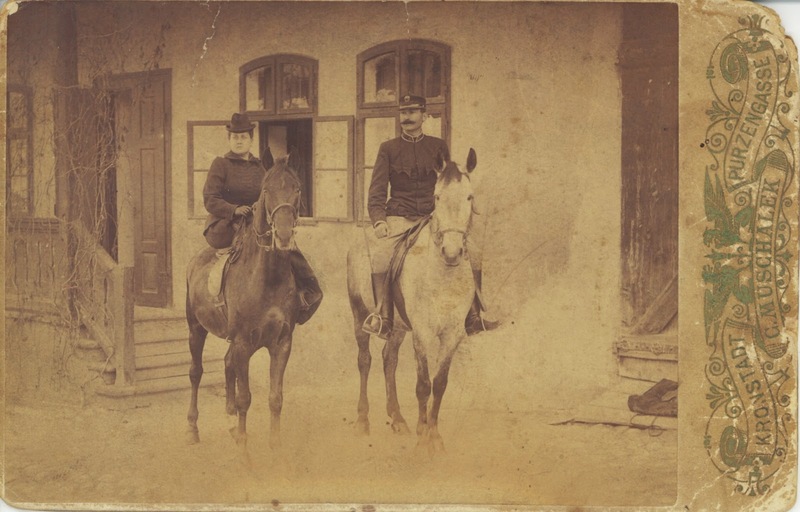 The descendant of this line, Eliana Tipurita, apart from very kindly allowing me to see the family tree, has also sent a photograph of Sandor Karacsony de Hodos, took in Hosszufalu (Glanzendorf) in the district of Brassov (Kronstadt) in Transylvania in 1898. The descendants of this line settled in Romania, where after the fall of the monarchy they became Romanian citizens.